What I mean by contacting them is just make any excuse speak to them. So, not contact them, at least speak to them and regularly; so perhaps every single day. Now if you think that is difficult, I would like you to write down a list on piece of paper as to why. Write down all the reasons, the genuine reasons why you think it is difficult to do. The chances are it is because you don’t like picking up the phone and speaking to people. That’s a kind of sales thing, it is a nervous thing, you are worried about what they might think, what they may say, what they may do. But just imagine this, you speak to your staff all the time, you speak to your friends all the time, you speak to your suppliers all the time. 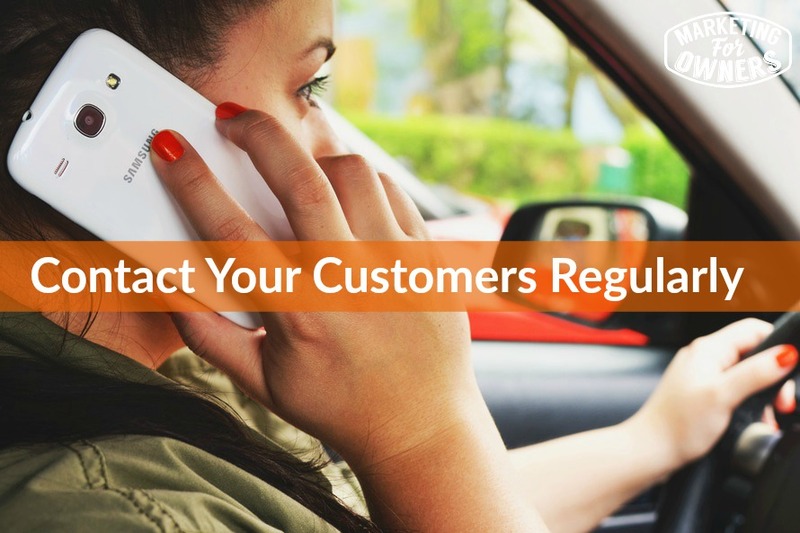 You have no problem picking up the phone and speaking to a supplier. So why would you have a problem speaking to your customers? Do you think you would be annoying them? Are you scared that they are going to tell you they hated your product and they don’t ever want you to darken their door again? Well it is not that bad because they are a customer, they have made a transaction; they have given you their hard-earned money, so they trusted you. Now this may have been a while ago, this may be recently, it may be yesterday. But imagine if you just contacted two a day, just two. So I am not telling you to go out for dinner with them, or have to go visit them, although that would be lovely, but to just contact them in any form. That is going to be roughly five hundred a year. It is ten been a week, two a day, ten a week. Now perhaps you have a Marketing Manager, a Sales Manager, a Customer Services Manager. How about making it their job? If you think that is difficult and you don’t have time, perhaps you have other things, perhaps that is not part of your remit. It should be really, because they are your customers who pay your wages and make your profits, or hopefully will if your contact them. But anyway, you can designate it to someone else. But if you make it a priority…So whomever you designate this to, explain why you are doing it. Now you may say okay why am I doing it? You are going to come up with any old excuse aren’t you, to get out of this, so I am not going to let it go. So you can phone them, you can pick up a pen and a piece of paper. And when I say “piece of paper” not a letterhead, just a simple piece of paper and write a hand-written note and sign it at the end. Don’t try to sell them anything. You want to say a heartfelt “Thank you. Without people like you, I would not have a business. And I want to say thank you for putting your trust in me; I will not let you down. Then sign it; as simple as that. Put it n an envelope, write the address, get a member of staff to write the address on for you and pop a stamp on it; even better if it is hand written and a real stamp; because they are going to open that and it is going to be very unusual. When have you even had one of those? Imagine if you got that. You would be pretty excited, wouldn’t you? So how about on the phone? What would you say? Well one, you could say exactly what I just told. But if that makes you feel a bit of a sap, a bit of a drip and you think it is a bit drippy, I don’t want it to sound like that. Say for instance if they are a customer quite a while ago and haven’t bought from you for a while you just want to say, “I am sorry I have never actually spoken to you and I never actually got around to saying thank you for your orders. Now what happens is you are then asking them for their advice. There is nothing, absolutely nothing people prefer more than being asked for their advice because it suggests a certain amount of authority and expertise and status. Now you are thinking to yourself, well no not if you are sort of saying how to improve my business. But yeah! If you ring them, if you call them, you are the boss. Who one earth does that? Has anyone ever, ever phoned you up for something like that, other than “Press star after this call if you would like to take part in a survey.” Whoever does those,by the way? What was I talking about? Or could you please contact to this and answer a survey? No, this is you, you saying personally “Thank you and I would like your help.” And what do you offer them in return? Imagine if someone said that to you. Think about it. These tips, they work, they are really really do work. It is all for you my friend. Give it a go, eh? Anyway, that was Monday’s tip and as it’s a Monday as you know we have a book for the week. Now if you listened to episode 450 recently and I know you will, you would have heard the wonderful Chloe Thomas. Remember she got the English accent and talked about e-commerce stuff. 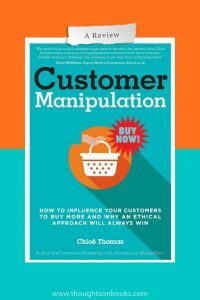 Well she has written a wonderful book called Customer Manipulation. Now it is not manipulation in a bad manipulation way, but customers are what make the world go round. In the same way as my tip, that is kind of manipulating your customer to help you build your business. So what she actually talks about is how to get customers, how to get them to make their first purchase an then how to get them to tell all their friends. And this is exactly what I talk about, but she talks about it in e-commerce, she talks about it in real life examples. It is a really really smart book; it is available on Amazon. And oh yeah, just to let you know, I would add, she did send me a copy of her book for free. So advertising people, I got a free one. But as you know I recommend a book every Monday. 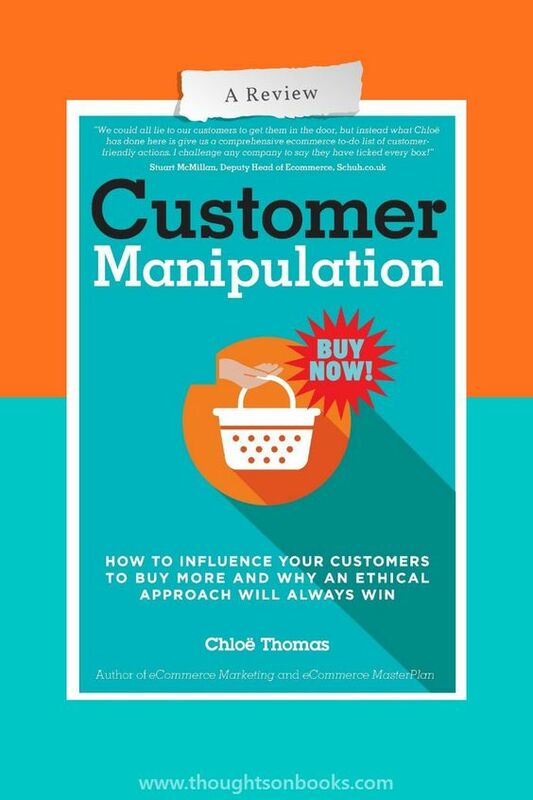 It is good, I run an e-commerce store and I learn stuff from this book and I have read one of Chloe’s other books as well, that is how I got to know her originally and I learned stuff from that other book, I have recommended it before. Customer Manipulation, you will learn and if you don’t have an e-commerce store you sell and you have customers, you will learn in the same way, seriously it is that good. Anyway, give it a go, I will be back with you tomorrow.